Free Time Calculator: How Much Time Do you really have? >> Free Time Calculator: How Much Time to Do You Really Have? If you’re like most people, you’ve probably convinced yourself that you don’t have enough time. Whether it’s time to set new fitness goals, start a new business or just about anything…we often give up before we even start because we believe it’s just not possible to fit in our busy lives. Well, the interesting thing is, if you sit down and do the calculations, you’d be surprised at just how much time you really do have. To make it easier to figure out how much time you actually have, use this downloadable time-calculator. It’s a simple, but highly effective, spreadsheet that will reveal the time you actually have to work on things you’ve been putting off. And it will help you identify the time blocks you can use to your benefit each day. 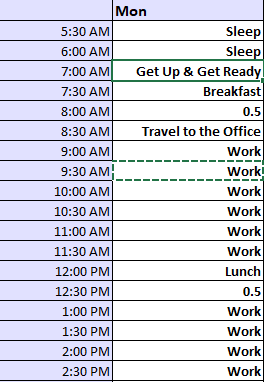 Simply open the spreadsheet and you’ll see all the days of the week across the top and then 30 minute time blocks on the side. These time blocks should start from the time you wake up to the time you go to bed, so you may need to make adjustments to suit your own particular situation and body clock. You can also switch to 1 hour increments, if you prefer. In each time block, mark in words all the times you are busy. For example, include time at your job, exercise, family time, church, meal preparation and eating, commuting, etc. Then for open blocks, write in “0.5” for each half hour block that you have free. If you switch to 1 hour blocks, enter “1”. Once you’ve completed these steps, you’ll see, calculated at the bottom, how much free time you have each day AND the total free time you have each week. Of course, this calculation is just the first step in getting more done with your time and reaching those big goals you never though you had time for, leaving you time and energy to ‘live more’. From here, you’ll need to connect that time to the goals you want to achieve and to the activity that you have identified as being what you want to do to ‘live more’.